Windows 8 Piano application or Windows 8 piano app is a metro-style virtual piano player application that is capable of multi-touch features of Windows 8. Downloading and using a virtual piano app for Windows 8 or for your Windows Phone 8, you can enjoy your kids to play Windows 8 piano app and have good time. You don't need to search for a free piano software download for Windows 8 computer or Windows Phone 8 smartphones any more. In this piano software download guide, I'll try to list a few of best piano apps for Windows 8. Windows 8 Piano app is a virtual piano program which you can download and install on your brand new Windows 8 tablet PC or touch-enabled laptop and customize the sound, piano keyboard, etc. Then you can save your recordings and play later again which is good for composing your music. 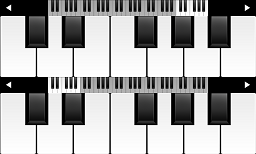 Windows 8 Piano application is a simple yet effective virtual piano app for a person who loves to make music using different instruments especially using keyboards. 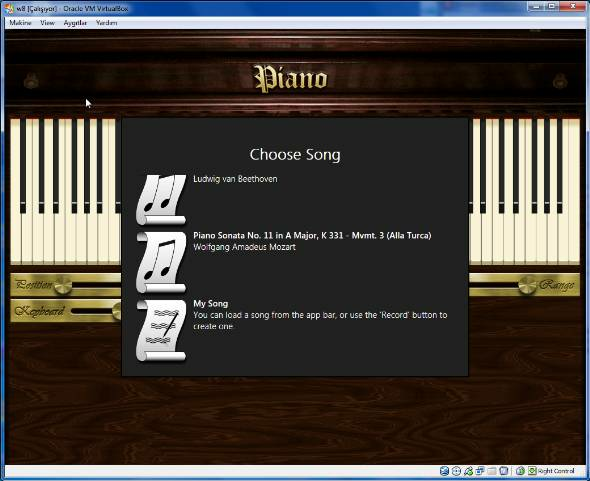 Below you can see the screenshot of your piano app software and the controls of the metro-style Windows 8 application. First of all, especially if you plan to play Piano using a multi-touch monitor, you can first adjust the size of your piano keys from the Range control. Range enables you to display starting from 8 keys to whole keyboard on the screen. This makes you a clear screen containing only the keys you want to use. Keyboard control adjusts the sound. Position control moves and zooms to a section of the keyboard on your piano. It is also possible to play pre-saved songs or record and play your own song. 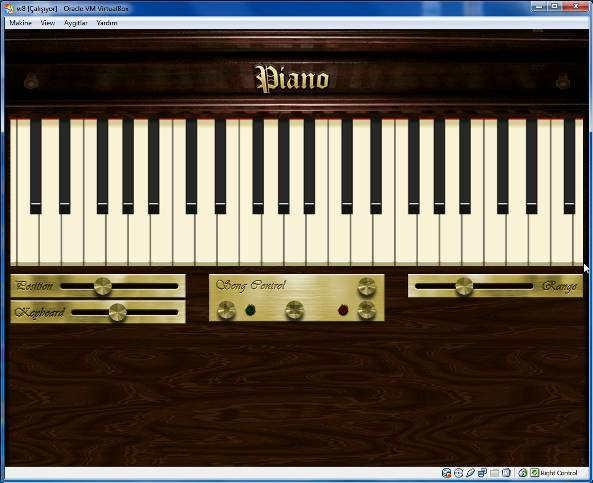 PianoPhone7 as the name implies is a piano application for Windows 8 or Windows 7 running smartphones. If you have a Nokia Lumia series (920 0r 820), or HTC 8X Windows Phone 8 smart phones, you can download PianoPhone7 from Windows Store. 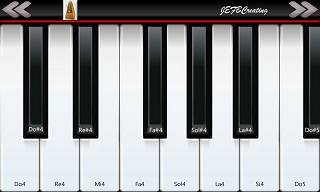 PianoPhone7 virtual piano app for Windows Phone 8 enables the piano player to choose his or her active octave using arrow keys and play realistic sounds. It is nice to display notation including European notaion on keyboard but unfortunately Piano Phone 7 does not let you save your work or play from previously saved song lists. 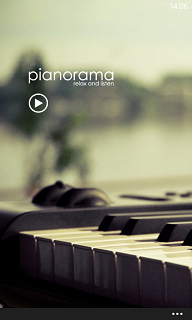 Piano is an other virtual piano app which can play great realistic sounds. The layout, functionalities and the outcome is very similar to PianoPhone7 Piano app with one difference in a positive way. You can choose from two different layouts. Besides you can play, of course if you wish with an additional keyword with a different octave. So you can play two keyboards at the same time. Piano software is multitouch enabled and great for your Windows Phone 8 running smartphone or Windows 8 tablet PC. Besides all above virtual piano apps for Windows 8, there are additional piano applications for kids to enjoy and have fun on your Windows 8 PC or on your Windows Phone 8 smartphones great for kids rooms spared on smartphones. These are keyboard apps more than piano applications. 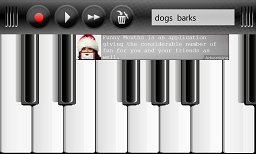 Dog Piano is one of such keyboard apps for Windows 8. Cat Piano is an other multitouch virtual piano app which enables children to play piano with cute 14 kitten voices. There is also the frog sounds version of lovely singing animals, named Frog Piano virtual piano app from Hde 7 software. What is good about Windows 8 piano applications from Hde 7 software is its app enables users to record while they play the piano and play it again. Unfortunately the free edition includes advertisements which can be a problem especially if you have small kids that can click on ads.